Home:Termite Inspection, Termites:When Do Termites Swarm in Houston? Bet you didn’t know there were types of termites in this world that don’t eat wood, huh? Well, there are, and we’re here to introduce you to the swarmer. Swarmers, also known as alates, are reproductive termites whose sole purpose in life is to mate. Swarming termites commonly get mistaken for flying ants, but swarmers have a more broad-shaped body type and two sets of wings that are even in length. Swarmers make it their life’s goal to continue expanding the population of their fellow termites and they’re willing to infest your skies with black clouds of termite terror in order to do so. Each year, usually around springtime, swarming termites emerge from their colony in what is called a “termite swarm”. In Houston, alates tend to swarm after large rainfalls or when the weather conditions are wet and humid. Hundreds of swarmers will flee in a matter of minutes in an attempt to find a mate before their wings detach and they are back on the ground. Unfortunately, the collection of wings that have been shed from termites’ past is the only, true indication that a swarm may occur, and you should call a professional if you see this alert near you. 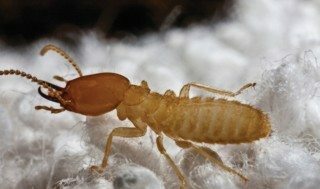 Termite swarms, although alarming, won’t hurt you. Alates don’t bite, sting or harm you in any way, aside from giving you a mini heart attack from their swarming activities of course. The bigger issue for property owners is the colonies that swarmers create. Termites will build their colonies nearby underneath rocks, in the root system of a tree, a patch of mulch – or worse, your home. They will quietly begin to build their new nest and send workers out to chew wood and bring it back to feed the colony. How Can You Prevent A Swarm From Happening? Eliminate or reduce moisture in an around the home, which termites need to thrive. Routinely inspect the foundation of a home for signs of mud tubes (used by termites to reach a food source), uneven or bubbling paint and wood that sounds hollow when tapped. Consider scheduling a professional inspection annually. Wood-boring insect damage is not covered by homeowners’ insurance policies. How Much Can It Cost Me If I Don’t Do Anything? Shockingly, termites cost U.S. property owners an average of $5 billion each year, with a single home spending close to $3,000 in damages. In order to avoid being part of this statistic, we recommend that you give us a call and schedule your termite inspection!